Here’s the water dispenser at our surgery center . . . But wait . . . what’s that???? 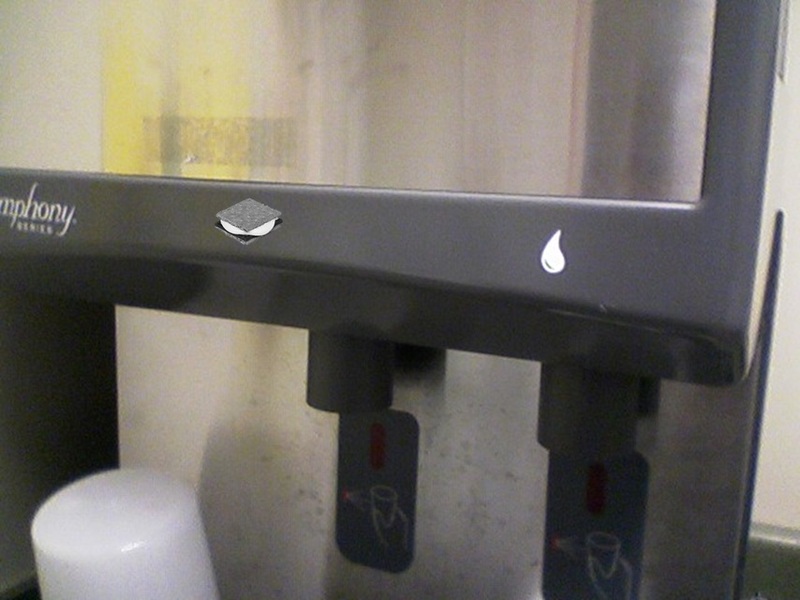 The ice “cubes” are actually little cylinders that sort of look like that picture. 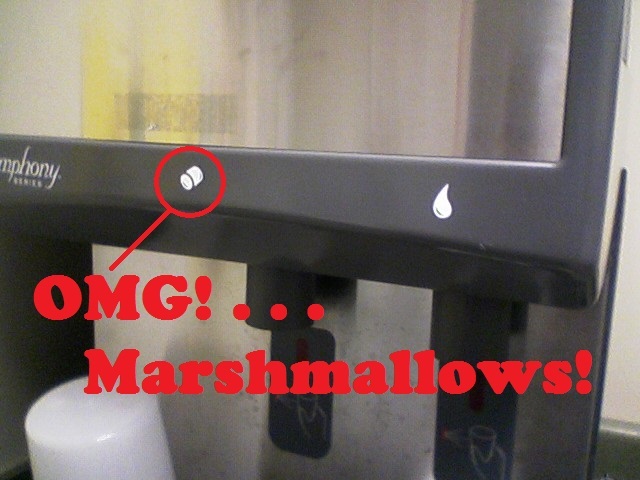 But the marshmallow thing would be a great idea! Maybe one for S’Mores! 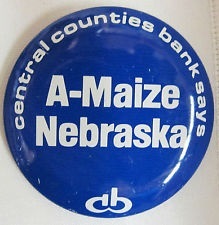 If you didn’t live in central Pennsylvania in the last forty years, you may not know what a “bank button” is, or more specifically, what a “Penn State Bank Button” is. The style changed slightly over the years, so that this is what it looked like 10 years later, when Penn State beat Nebraska en route to Joe Paterno’s first national championship. Over the years, things slowly changed. Central Counties Bank became Mellon Bank. Mellon Bank became Citizen’s Bank. The slogans evolved from simple two and three word phrases to more creative slogans as Sleepless in Ann Arbor (Michigan 1994, playing off the movie title Sleepless in Seattle,) Driving Mich Crazy (again, Michigan in 1997, playing on Driving Miss Daisy,) and Don’t it Make Your Buckeyes Blue (Ohio State in 1999 off the song with brown eyes blue.) You can see the entire list of buttons ever made here. But I’m not here to critique the slogans. If you don’t know already, I am a Penn State fan, bleeding blue and white. When we returned to Pennsylvania in 1994 after graduating from my residency program, we were faced with having to choose a bank. Sure, I could have researched who had the best interest rates. Or who has the most convenient ATM locations. Or used any number of other pertinent criteria to choose the right bank for my personal accounts. In the end, I chose Mellon Bank . . . BECAUSE THEY PRODUCED THE PENN STATE GAME BUTTONS. I kid you not. Been a customer ever since, even though the name changed to Citizen’s Bank. Not a problem for me. They still make the buttons. Since 1994, I have always had a good relationship with my bank. I am a good customer. They may not pay me as much interest on my savings account as someone else, but come August, I could always count on getting a stash of the season’s game buttons. It was like Christmas in September! Someone at the bank–and we have moved since 1994 to another city–and a couple of branch offices have closed over the years–but someone always set aside a quantity of buttons for each game and I would pick them up before the season. Most years they gave me an entire plastic sleeve (20 some buttons) for each game before the season started. During the season, I would distribute the appropriate button to friends, relatives, fans, and my co-workers and employees the Wednesday before each game. I never gave them out early to spoil the surprise, and I never charged anyone for the service. It was a wonderful system that worked well for all parties involved. When I called to arrange picking up my buttons, I was told they couldn’t do that any more. There was a “MEMO.” From “Corporate.” Apparently, access to game buttons is now being regulated by the NSA. It is frowned upon in their establishment. Now let me tell you how this whole thing works. The Wednesday before a given game, someone at the bank puts the buttons in a basket on the counter for patrons to take. The button has the Bank’s name on it, so it is essentially free advertising for the institution. If you have ever been to a Penn State game, you can see a lot of people wearing these buttons. A fair number of dedicated fans “collect” the buttons, displaying them in various ways. The bank informs me that I can get a complete set by mailing a check for $10.00 to the bank. That’s a set of one button per game. Let’s see, 20 sets? $200? And I give them away free? I don’t think so. They want my business AND they want to charge me for advertising for them! Is it company policy, then, to alienate a dedicated customer like this? Now I have to make 12 trips to the bank in 3 months (I usually go once a month, and that is only because my paycheck exceeds the amount that can be deposited by their mobile app, or I wouldn’t even go then.) As a surgeon, it is not always convenient for me to drop by the bank during the week. And since I’m still getting handfuls of buttons (which I don’t get paid to distribute) each week, what difference would it make if my bank helped me out a little. I suppose I should be thankful they don’t limit the buttons to one per customer! It’s not like a convenience store or grocery, where a free coupon might draw other business while I’m in there shopping. I’m not likely going to stop by and pick up a button and say, “oooh, that is a great rate on a loan. Can I get one today? Or how about giving me two of those Certificates of Deposit over there.” Forcing me to enter the bank doesn’t generate any more business. But the advertising might. Isn’t that why they are still doing it? I see a lot of people during the day, and have frequently fielded questions about the button. One of the most famous was Forrest Thump. Think about it. It’s a play on Forrest Gump. Penn State played Indiana State. Their mascot is a tree–the sycamores. Trees=forest=Forrest. Tree falls–thump. Team falls–thump. It’s probably a little too complicated for a fan button, but it generated a lot of questions. And that’s a lot of eyes looking at the Citizen’s Bank logo. I’d close my accounts and switch banks as a protest if it wasn’t so much trouble. But I think about doing that every week when I grab my handfuls of buttons which should already be in my desk ready for distribution. I’m starting to hate my bank. But alas, I still wear the buttons, because at the heart of it all, I am a Penn State fan. I just wish my bank would stop pushing my buttons!